Phoenix Pediatric Dentist | Peck Family Dentistry, P.C. At Peck Family Dentistry we want to make certain that your children develop and keep up a steady oral hygiene routine that carries on into adulthood. If you are in need of a Phoenix pediatric dentist, Dr. Hillary Peck loves seeing children. Having two children of her own, she understands the necessity for good dental health at a young age, educating your child on brushing and flossing in a way that is pleasurable and pleasing for all involved. Dr. Hillary Peck enjoys making your child’s dental visit fun and a great experience. She does a lot of show and tell in making sure your child’s visit is comfortable yet at the same time educational. 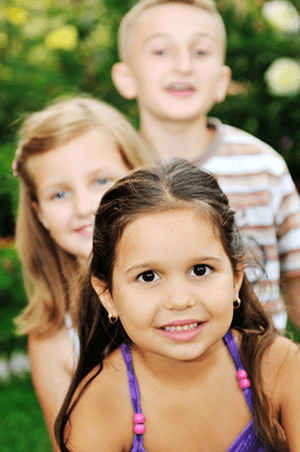 Children seem attracted to her personality and feel relaxed in her presence. A pediatric dentist is one who has completed four years of dental school with an additional two years of specialty training to treat children only. As a general dentist, Dr. Hillary Peck is not licensed as a pediatric dentist. However she loves treating children. Basic dental school education includes a number of courses in pediatric dentistry, which have prepared her for meeting all of the basic dental needs of children. If your child does present with any unusual problems requiring a specialist’s attention, she will tell you and will refer you to a pediatric dental specialist. Many parents, however, prefer the convenience and personal relationship that comes with having the same dentist be able to take care of the entire family. Many parents are anxious about the type of experience their children will have at the dentist and go to great lengths to prepare them. However, this approach can backfire. Children can sense your anxiety and the more you prepare, the more anxious they can become. Parents who treat the visit as “no big deal” seem to have the best results. And when you have the same dentist as your children, a nice way to introduce them to the dentist is to first bring them with you when you have a checkup. This will help them know what to expect. For more information, please see our dental tips for parents page.